In the hyperlinked world of technology, things can move quickly. Information traveling at lightning fast speeds, sprints of work in response to new ideas, collaboration and communication supported in digital spaces—all setting a pace for advancement, action and innovation. Today, edtech companies and teachers are considering the learning needs of students as well as ways technology can support all areas of development, including empathy, connection to others and cultural identity. Teachers exploring spaces of educational technology are leading the way by not only adding the context, but by being the context. The Participate mission of ensuring equitable and inclusive access to quality education is what drives every decision we make. We are constantly looking for opportunities to hear from teachers and create dialogue with others in the edtech space that are interested in doing well and doing good for our world and for our world of classrooms. This past summer, we came across the great work of Empatico, an initiative of The KIND Foundation. Empatico is a free, online learning tool that connects classrooms across the country and the world to help kids expand their world views and practice curiosity and kindness. With synergy in both mission and core values, we quickly found fellowship and friendship within our teams and in our shared passion of connecting teachers and students of the world. Through Empatico, we are watching classrooms of 8-10 year-olds connect with others via video and engage in global activities grounded in universal topics, such as Ways We Play and Helping Hands. Students explore their similarities and differences, understand new and diverse perspectives, and are more prepared to make positive change with their new global friends both at local and global levels. And teachers love Empatico, too. At a recent Edcamp, I heard about Empatico and was very excited to learn more. I love that my teachers could jump right in and begin the learning experiences as soon as they were partnered with another class worldwide. Bottom line, the hard work was already done, and we could hit the ground running with teaching and learning. After we connected with our partner class, it was incredible to see the students begin to form their own opinions—not opinions belonging to their household, necessarily. It gave me chills to think that Empatico has hit on something very huge here. You are globally connecting students, and they are realizing the power in relationships. With relationships comes perspective. 'I don't want a wall between me and Elena,' said one of my students. No...no walls. We're above that. This speaks to the power Empatico can give to the next generation - to see beyond. - A 4th grade teacher in the U.S.
Read more about how hundreds of teachers around the world are having similar experiences to Debbie and her students. For the teams at Participate and Empatico, these moments connecting with and hearing from teachers are our fuel and drive us to continually improve. Recently, we started asking questions about “what if”—thinking of ways to bring edtech organizations and teachers together to discuss where we are, where we are going, what teachers and students need, and where we need to be going in edtech. "I believe the top five things that guide me to work with an edtech company are student engagement, instant data, collaboration, constant communication and being able to flip the classroom. These companies are changing the face of education." 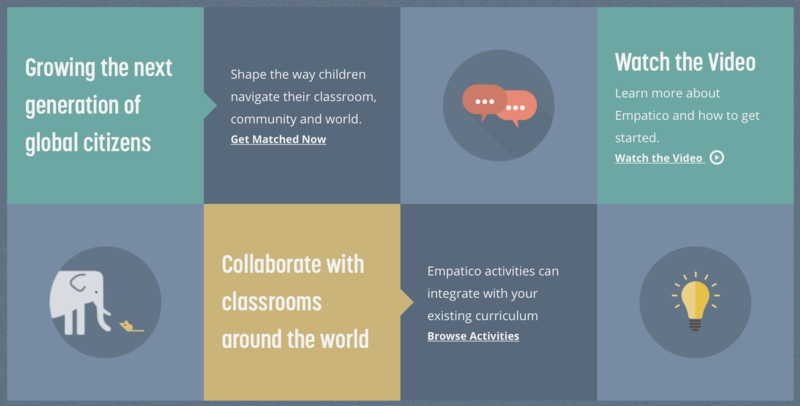 Join the Empatico Community to get new classroom resources and collaborate with others!